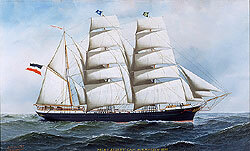 Antonio Jacobsen, America's folk art hero recognized for his unsurpassed contributions to America's maritime history, recorded domestic and international ships as they passed through the age of sail to steam. He was a prolific painter and throughout his life painted an estimated 6000 paintings. Jacobsen was born in Copenhagen, Denmark, on 2 November 1850, where, for generations his family had been violin makers. His father encouraged him to practice a similar craft. At an early age he enrolled at the Royal Academy of Design in Copenhagen, however, reversed family fortunes forced him to withdraw. 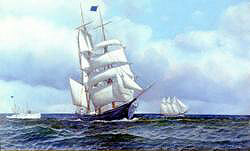 At the age 18 it was compulsory for him to join the Danish military forces, he decided instead, to sail for America. 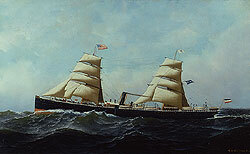 He left his family behind and arrived in New York in the early 1870's. Like many other immigrants, he went to New York City's Battery Park looking for work. He passed his days sketching the ships that sailed in and out of the harbor. Not before long a representative from Marvin Safe Company noticed his drawings and offered him a job decorating safes. 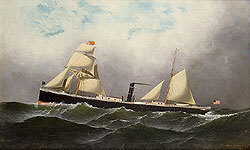 His ability as an artist was further recognized as he began to receive commissions from sea captains and ship owners and eventually Steamship companies, to record their entire fleet. 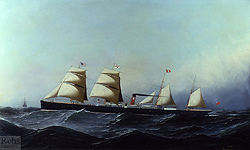 The Old Dominion Line, The Fall River Line and The White Star Line are some of the steamship companies that commissioned him to paint portraits of all the ship in their respective fleets. 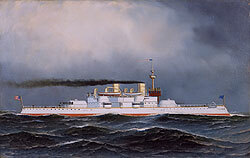 In addition, the Clyde Line, the Black Ball Line and the Mallory Line, the Anchor Line and Red Star Lines also sought his services. 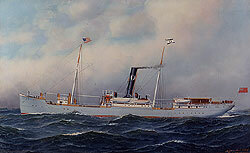 The notoriety that Jacobsen received from all these commissions helped establish him as the foremost chronicler of American shipping in the late 19th and early 20th centuries. In 1878, he married Mary Melania Schmidt. The couple established residence, combining their working and living space, in New York City at 257 Eight Ave. Three children were born to the couple: Carl Ferdinand, Helen and Alphonse. 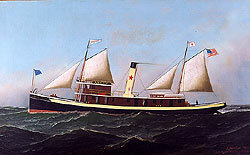 Both of Jacobsen's sons were competent painters. 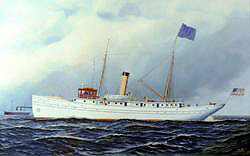 In 1880, with Jacobsen's increasing prosperity, the couple was able to move to a beautiful house in Hoboken, New Jersey. This home became a mecca for seafarers and artists as well. On Sun­days, Jacobsen would arrange concerts, at his house, of he and his friends playing chamber music or string quartets. 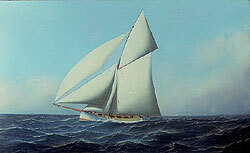 Several of the artists that visited include Fred Pansing (well-known ship painter at the time), James Buttersworth (painter of delightful yacht pictures), F. Bishop (marine artist from New Haven) and Frederick Cozzens (Staten Island artist, who specialized in harbor scenes). Jacobsen's work was sought after in his day, and if he was short of funds, he had no trouble finding commissions. At a time when a certified public accountant was earning forty or fifty dollars a week, Jacobsen earned $150 to $200 with little effort. When lithographs became popular, however, orders for Jacobsen's paint­ings dwindled and he refused any attempt to commercialize his paintings. As the years passed, Jacobsen's style became more progressive, he depended less on commissions and more on his own creativity. 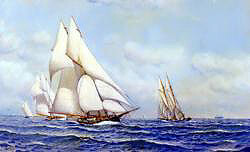 His rigid style softened and he painted imaginative marine works - including racing scenes, shipwrecks and some ocean views. Works by Jacobsen can be seen in most major collections of marit­ime art including the: Peabody Museum, Salem, MA. ; The Mariners Museum, Newport News, VA.; Seaman's Bank for Savings, etc. Reference: Antonio Jacobsen, Marine Artist, Staten Island His­torian XXII #2, April - June 1961, pp. 9 - 12.